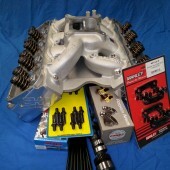 CHI CNC ported 18′ degree heads have been developed in conjunction with top US head porter Phil Martin, capitalizing on Phils 20+ years of top tier cup and dirt track experience has created high end range of heads at an affordable price, for circle track or drag racers who want to benefit from huge horsepower increases over traditional performance chevy heads. The CHI 18 degree head features re positioned valves, moving them closer to the bore centreline significantly increasing potential flow to suit power well over 700HP. 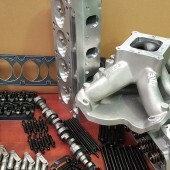 New for 2012 is the CHI range of Chevy heads, our 23 degree Small Block head is a 215cc intake head designed for circle track or drag racers who want to benefit from significant horsepower increases and less weight of traditional performance chevy heads. The CHI 23 degree head features 40/60 valve spacing significantly increasing potential flow. 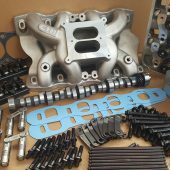 The CHI raised inlet aluminium 23 degree head was designed for racers looking for more power without the added cost of building a new motor. 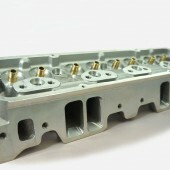 The CHI RI head uses the same components as a standard 23 degree head (pistons, rockers, inlet and exhaust manifolds). But because inlet ports have been raised .200″ much higher flow figures can be achieved. 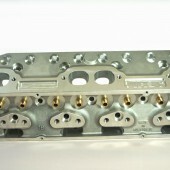 The RI Head also takes advantage of the higher flowing 40/60 valve spacing. 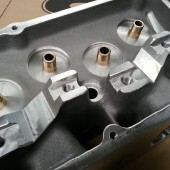 Suitable on engines 330 – 430 cu inch. 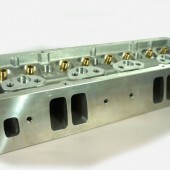 CHI heads can be supplied CNC ported in a number of port sizes to suit your application.